If you have been reading this blog, your children have tried practicing rock pose, a great centering pose, and Lazy Lizard Pose, a nice way for kids to learn how to relax. What if you put them together? Then you get a lizard on a rock! Lizard on a rock pose, is a partner pose, that encourages kids to work to together, respect each other and most of all have fun! 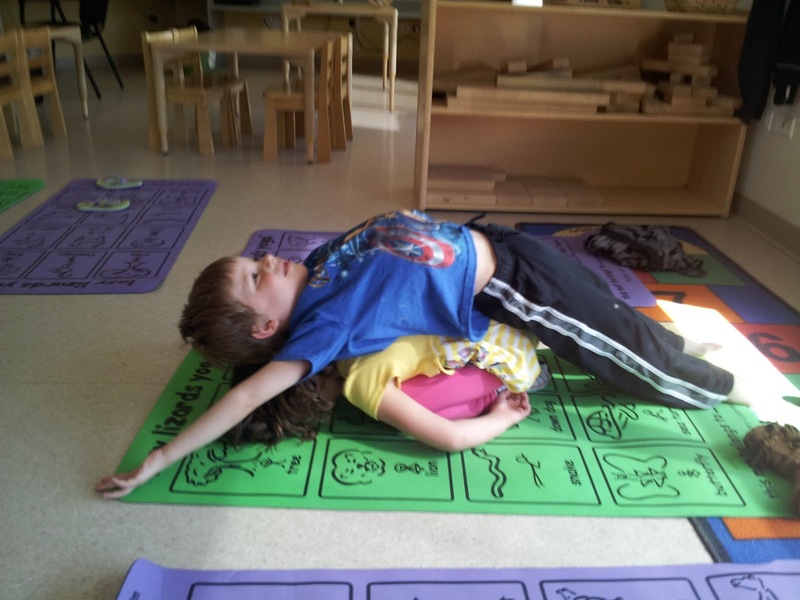 Please make sure you supervise the kids when first practicing this yoga pose, explain how it is important to listen to their partner, move slowly and gently and make sure they know where the lizard is supposed to sit. To practice lizard on a rock, have one child come into rock pose, make sure their forehead is on the ground, so their necks are protected. Next have the second child, come behind the rock, so the children are faced back to back. The lizard will sit gently on the rock, around the end of the child’s tailbone. Have the lizard pause and ask if the rock is ok, if not try again, or maybe have the kids switch positions. The lizard will then gently lay on top of the rock, and eventually will be back to back, and back of heads touching. The lizard will can stretch his or her arms over head and stretch their legs long. Then encourage the rock to do deep belly breathing, and ask the lizard if she or he can feel the rock’s breath. When the kids are ready to come up, have them come up together on the count of three, gently and slow. Have the children switch switch yoga poses. And yes, Mom and Dad you can also do this with your children, just be the rock. 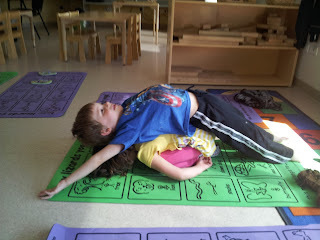 This partner pose can be lots of fun, and encourage kids to work together. After the children are done, ask them which pose they liked better and why. I have received responses like, “I liked rock because I got to stretch my back.” and “I like lizard because I get to sit on someone.” Remember there is no right or wrong to this answer, it’s just how your child feels. Practice this pose as a family activity before or after school or work, and have fun with the entire family!